Pheobe Holder ( nee Mulerine ) came to Glasbury from Liverpool to work for the Land Army. She was a telephone operator from Walton. Whilst working in Glasbury she met and married Lesley Holder, a farmer of Prospect farm, Cwm-bach, Glasbury, and in November 1944 they had a baby girl. Pheobe went to Llandrindod Wells hospital for the birth of their baby. 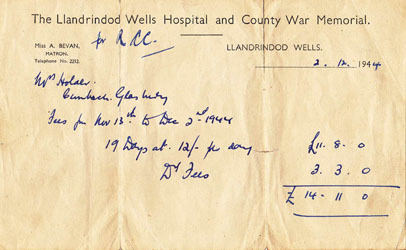 It cost them £11 and 8 shillings for the hospital bed and £3 and 3 shillings for the doctor ( see attached Bill ). In those days hospital fees were applicable and having a baby usually equated to a fortnights rest and recovery. They lived in a cottage at Ffynnon Gynydd but this proved to be too isolated and quiet for Pheobe and eventually they both moved to Walton, Liverpool - her home town. 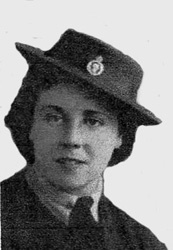 Pheobe was on the Movitone News in the cinema and portrayed as the first women in the Land Army to drive a farm tractor. The hospital bill prior to "Free at the point of service"